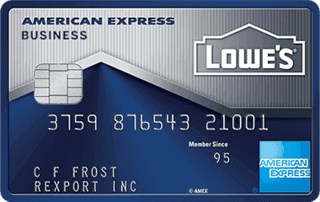 Lowe's Business Rewards Card from American Express is typically available to those with good credit scores (650 or greater). A worthy credit card for the Lowe’s regular. It offers a helpful 5% discount each time you buy eligible items at the home improvements superstore. It also offers a variety of categories in which you can earn accelerated rewards. For all of this, you’ll pay a $0.00 annual fee. There are a lot of cards that earn at a higher rate on all purchases than this card does on just Lowe’s purchases. The sign up bonus is also exceptionally small. Because of all these factors I don’t recommend anybody signs up for this card. On wireless telephone services purchased directly from US service providers. - Get a 5% discount every day from Lowe's on eligible Lowe's purchases.